Mr. B has gone through 3 different science programs this year, and we were needing another when the review for Nature's Beautiful Order, by Memoria Press, came around. I couldn't have been more excited as this filled a great need! 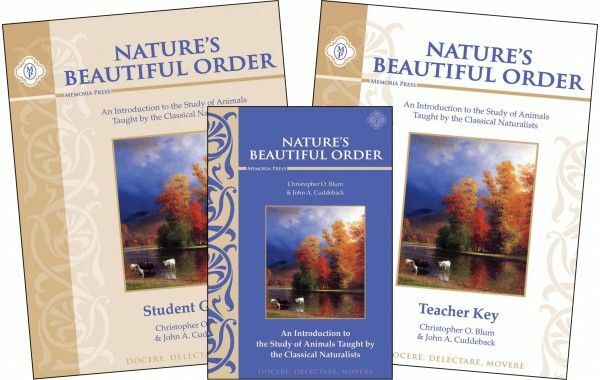 Nature's Beautiful Order is a Christian based science program that seeks to show the natural order of the Animal Kingdom, ending with man as the all knowing, dominant animal. For this review, we received the complete set that contains a student text, student workbook, and a teacher key. The Student Text book is small, but it packs a serious punch. There is a lot of information in this book. I found Mr. B would get lost in the words since there aren't a lot of pictures, so I would limit the amount of reading he would do. There's no set pre-made teacher plan or schedule, but there are 18 chapters. So I elected to do 1 chapter spread over the course of 2ish weeks to provide a full year. Each chapter builds upon the next. Chapter 1, What is an Animal, starts off with the cat and is a basic overview of what is to come, what an animal is, the difference between living and non living things, and classifications. Then we progress through invertebrates to vertebrates, birds, and mammals on our journey to the top of the natural order of the animal kingdom with a study on Man. I had Mr. B read a few pages 3 times a week, and work the corresponding questions in the student guide. The teacher guide provides all of the answers, which answering questions super easy. I wish there were more pictures, and perhaps a cumulative review here and there, but it doesn't really take away from the contents. If your child is more visual, like mine, and prefers less words, then you may want to look this over to decide for yourself. Many times, we would do the reading, answer the questions, and research for our own pictures and videos of what he had just read about to tie in the visual aspect he needed. Overall, this is a really in depth course for the grades 6-9 crew. Some material, such as living vs. non living things, is below that age group but the reading level is on par, as are the questions. There is a nice mix of straight forward questions along with critical thinking questions, and ample room to write your answers in the workbook. Does Nature's Beautiful Order Pass My 4 Ingredient Test? This is a physical product, so you can tweak as you need. The student workbook is consumable. There's no set plan or schedule, so you can create your own as you see fit. There are no hidden fees. This would cover a decently wide variety of grades. I could see an older 5th grader to 9th easily doing this. Here's that gray area that really depends on your child. Mr. B needs more pictures and the text broken up more to fully keep his attention when the topic isn't one of his preservative topics. With that said, I was able to break this up into smaller segments so it works just fine for us. We will likely complete this before going on to another. This is a good standalone for science. It goes right with classical education methods. As far as if it is a unit study type program, it is not. The Homeschool Review Crew was blessed to also review another science program, along with Latin. Please click the banner below to read more reviews!